Finding the right wheelchair can often take a lot of time and a lot of hours sitting in an uncomfortable chair. Not every wheelchair user parks their bum in a wheelchair and it’s perfect for them. Funny that, right? You’d think we all had the best experience, received the best advice and the best fit but it’s simply not true. It took me about five years to find my powerchair, my perfect wheels. It took a lot of money, a lot of aching, a lot of crying and a lot of research. I didn’t have a positive experience with wheelchair services; the criteria where I live for a powerchair is very strict and because I can walk and don’t require a chair indoors all the time, I was denied. Being denied the chair I so desperately needed to get my independence back meant that I was also denied any advice on what chair I should be looking for. I spent quite a few years in a manual chair that I required someone else to push and because I’m a control freak, this caused a lot of frustration and to this day I’m still surprised my boyfriend has a head as I bit it off far too often. I needed a powerchair for both our sakes; mainly for me (obviously) but it certainly helped him out too. After consulting with my medical team, it was decided that a powerchair would make a massive impact on my life and I’d be able to do so much more than I was and be the one in control of what direction I was going in. However, because wheelchair services weren’t willing to help, my information on what powerchair to go for ended there. So, yes, I needed one, but which one? There’s so many makes and models of chairs that I wasn’t even sure where to start. I remember my Nan had a Pride mobility scooter years ago so looked into them and decided on a really basic powered wheelchair. I fundraised for it as there was no way I could afford £2k and was lucky enough to raise it in a few weeks. When I say the chair was basic, it was BASIC. It couldn’t be adapted; it had a fixed footplate, the seating was stiff and there wasn’t any support. Naïve me believed this would be perfect as it’d get me out of the house but it didn’t cross my mind how bad sitting in an uncomfortable chair would affect me. My thighs were always tensed as I had to keep my legs really close together to rest them on the footplate. My back, hips and shoulders were in agony after sitting in it for less than half an hour. My arms hurt because the armrests were too low. The issues with it were unexplainable. I began resenting it and felt a massive burden of guilt as so many people had donated to help me get this chair. But it was destroying me. It was doing more bad than good. It made me want to stay in as I hated using it because the pain was too much. After a lot of crying and talking to family and friends I decided I needed to do something about it. I needed to get a new chair. I needed a wheelchair that gave me that independence I craved so badly. I went back to the drawing board, I researched and went to a local mobility store. There I spoke with a dealer who really understood my needs and showed me all the things that I could have and we worked out whether I’d need them or not. In the end I went with an Invacare TDX SP2NB with adjustable leg rests, back recline and seat tilt. I have the comfiest back support and an inflatable seat cushion that I can adjust on a daily basis if I fancied it. I’ve had this powerchair for over two years and it has made a massive difference to my life. I am actually comfortable when I go out. I can stay out for longer. I can live. 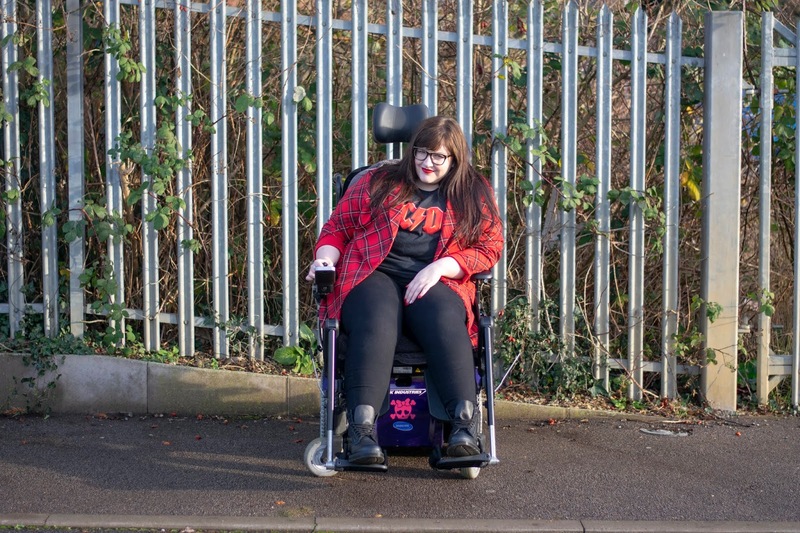 My wheelchair doesn’t make me better, it doesn’t make my pain go away, but on the days I do go out in it, I have options on my seating positions and to help make me more relaxed. Just today I had to go to a doctor’s appointment; I have been in a flare for a few weeks so was already suffering and sitting in my powerchair hurt, but as did sitting in any chair. However whilst I waited (and I ended up waiting a long time as they were running late), I reclined my seat, elevated my legs and tilted my seat; I was basically lying down in the middle of the waiting room just to be comfortable. None of my previous chairs would have given me that option, I’d have suffered way more than I needed to. The right wheelchair is massively important, and it’s vital you do your research and get the right set of wheels for your needs. Everyone is different and it’s a huge investment, especially if you’re self-funding, so take the time to speak to other people, read reviews and get the best mobility device for you. Make sure you check out the honest reviews on Access Your Life, they’re so beneficial and I only wish this site was available when I was working out which powerchair would work best for me. Read all about my wheels here. Have you checked out Access Your Life?